Oh how I wish the title of this post were true. Wouldn't everyone like to be a mermaid? I think I would. Or a fairy, or a unicorn. I'm not too fussed on which. ANYWAY. Enough of my fairytale ramblings. How amazing is this outfit?! Okay, it's probably not everyone's cup of tea, but it is 100% my idea of a gorgeous spring outfit. Pastels? Check. Cute sandals? Check. Floral headband? Triple check. Pastel blues and pinks are my favourite, and as they feature heavily in this outfit it's no wonder I love it so much. I got this awesome shell/mermaid print top from River Island last summer when they were doing the 20% off for students (which, coincidentally, they are doing over the next three days) and I love it so much. I thought it would go pretty well with my trusty Primark ombre cardi, and this AMAZING Topshop skirt I also got last year. My favourite things about this outfit? The accessories. As you may have guessed, I am a big accessories junkie. I love love love jewellery and lately I can't get enough of floral headbands. This absolutely amazing pastel-coloured floral headband is from Crown and Glory (where else?!) and it has to be my all-time favourite headband. I included it in my Passion for Fashion 2 entry a couple of weeks ago and I just know I am going to get SO much wear out of it over the summer, as it features all my 'signature' spring colours. I can't recommend Crown & Glory enough for their stunning headpieces. Now, onto my other favourite thing. I was recently sent this 'I'm Really a Mermaid' necklace from I Love Crafty and I am so, totally, head-over-heels in love with it. I've wanted something with the 'I'm Really a Mermaid' quote on for SO long, and this mirrored shell necklace is most definitely the cutest piece of jewellery I've ever laid eyes on. There are so many completely gorgeous pieces on I Love Crafty; I basically want ALL the mermaid things. 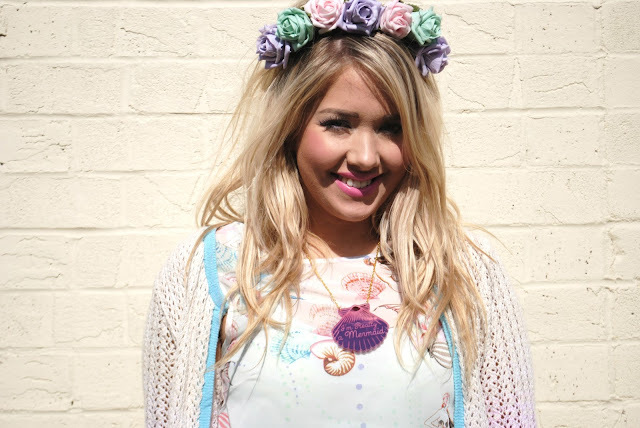 What do you think to my Spring-has-sprung mermaid-themed outfit? Hope you're enjoying the sunshine!